Travel with Kevin and Ruth! : Back in the U.S.A.! We were up early yesterday morning, and on the road before 9:00am. We were only 20 kms (12 miles) from the border crossing, so it wasn't long before we pulled over at the inspection and customs building. This border crossing is one of a series of old and underutilized road crossings between the U.S. and Canada in the Saskatchewan and Manitoba area. The border guard we spoke to said the building dates back to well before the 1950's. But they only process about 50 cars per day here so not much point in spending millions of dollars to update things. We got to talking to the U.S. border guards. There were only two of them there. They asked where we were staying. "Couchsurfing. Have you ever heard of that"? I explained. "I've heard of it, but I would never do it", said the female guard with a sour look on her face. I never did see a smile out of her. I've said it before, but I don't understand why these people can't do a good job but do it with a pleasant attitude. Her older male co-worker was a little more talkative, but when we were telling him about Mexico and Guatemala you could see that he simply didn't understand the attraction. Just shaking his head at us. Anyhow, made it through the border and headed for Grand Forks, North Dakota. Not much to see along the way, in fact we didn't take any pictures. Yesterday's drive, 190 miles (305 kms). Stopped for gas in Devil's Lake and paid $3.54 per gallon (about $0.95 per litre Canadian) for gas. Saw the tourist info office coming into Grand Forks and picked up a city map and used their free wi-fi to check emails. Then we went downtown and wandered around. Our couchsurfing host Jasmine is a reporter with the local newspaper here and had been called out on a story and wouldn't be back until sometime in the evening. This is one of those time where it would have been handy for us to have a cell phone, but instead we managed with email and found the library and other sources to stay in internet communication with her until she returned. The river running through the downtown area is the actual border between North Dakota and Minnesota. So one the west side of the river is Grand Forks, North Dakota, and on the east side is East Grand Forks, Minnesota. There's a recreational path running in the greenspace along the river on both sides. So we went for a 3 mile (4.5 kms) walk. There's a large campground right close to the downtown area and we saw this odd looking trailer. There's a winch system that lowers the trailer to the ground! Ruth, and The Greenway recreational path along the Red River. It was a nice enough walk, but the path is really better used by bicycles. There's not really a trail right beside the river because this river has severe flooding problems in the spring and anything closer to the river would get damaged every year. One of the new dams on the river. The old St. Michael's Hospital and nurses residence is now a historic building. Built between 1907 and 1914. Back in the city, we found the St. Michael's church built around the same time. I guess the church business was doing pretty well back then. Hmm. You can paint your house whatever color you want to. Or colors. 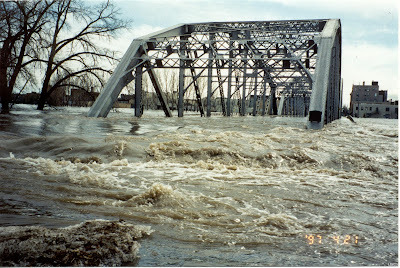 Grand Forks made the news in 1997 because of the devasting record flooding they were experiencing. They've now built a huge wall around the downtown area to contain the water, and they've also built a reminder of the highest water levels over the years. The Sorlie Bridge. You can see Kevin standing beside the marker that says the water height. A file picture showing the same bridge in 1997!!! Kevin, by the high water marker showing the dates that the flooding was really bad. Checked in with Jasmine, and she said she would be back around 8:00pm. So we went and got some dinner. This is the first time we've eaten in a restaurant since April! We went to an Asian place and Ruth had a chicken curry and I had beef pad thai. Not bad, but not great. Total including a beer, tax, and tip was $32. Ruth's chicken curry. Nice presentation, but it was advertised as being on a bed of spinach. No spinach to be seen. The waitress said "oh, they changed the menu. We don't have any spinach". Hmm. So we met up at Jasmine's apartment and stayed up talking until 11:30pm. Once again, a great couchsurfing experience. Today, we're off to Duluth, Minnesota! Sounds like you're enjoying the trip. I lived in Edina, Minnesota in the 70s and liked it very much. We flew to our new home in February 1976 and the stewardess talked with 10-year old son, Spencer. She asked if he'd ever been to MN before and he answered, "No." She explained, "Well, when I first saw MN in the Winter, I thought it looked just like a Christmas card. But after living here a while I realize that Christmas cards look like Minnesota!" He was hooked! Yep, I can believe that, like Canada, Minnesota is not somewhere that we would want to be in the winter. We would like to take more time to explore it though, when the weather in nice. Interesting exchange with the border guards. Usually they don't like to chat That might lead you to think they're close to being normal. My take is, their "training" precludes their ability to have an original thought. Hence the reason for being mystified about Mexico. If you only believe what you're told to believe, then that's all you'll ever know. I'm sure they would have been just as mystified if you had told them about travelling to say, The Czech Republic? Goodness, how very open minded you are this morning. Let's see, the border patrol people weren't rude, they didn't unnecessarily delay Kevin and Ruth or treat them in any way unfairly, they simply didn't share the same interests...and on that basis, their training as well as the individuals themselves are slammed. Bob, I think that the "mystified" reaction isn't just a border guard thing. We get that reaction from many people both U.S. citizens and Canadians. Unfortunately the media seems to be doing their job well at making Mexico look bad and if they haven't been there themselves then they believe the media hype and can't figure out why anyone would want to go there. We camped in that park, it use to be a residential neighborhood until that flood in 1997 so they put in the park. Since all the utilities were already there it made for great FHU sites. It was also fun that it was within walking distance of (2-4blocks) of downtown East Grand Forks and just a walk across the river from Grand Forks. If you like to bike there are a lot of trails that will take you out to UND. Make sure you enjoy the Canal zone downtown Duluth and view the big ships in the harbor. It is totally unbelievable that the water was up that high. We just can't imagine what it must have been like. We think they have done a good job with building flood banks and walls to try to make sure that if they ever have a flood like that again that they will be able minimalism their damage. We love biking but unfortunately don't have bikes and yes, we can certainly see how nice it would be to be able to bike around Duluth. Sorry but that polka-dot house is pretty ugly! Wouldn't you just hate it if your neighbor did that! Ha! It sure is fun to look at but I have to admit we would hate to have it as a neighbor too! I think you must be starting to follow our lifestyle when "up early and on the road by 9 am"!! Good for you guys!! Sounds like a great day. And the question everyone is wondering is...."How was the beer"??? We knew that we didn't have to be going too early so 9am was a pretty good start for the day. Kevin definitely enjoyed his beer except that it was an expensive Canadian beer...yes he broke down and bought a 12 pack in Killarney, Manitoba. Looks like y'all had a very HAPPY DAY, enjoying GRAND FORKS, ND... The river-walk is so pretty, NOW, but wait until SPRING... Wonder IF the 'high-water marker' will survive the next flood?? Ms Grace probably lives in an HOA, where you can't FLY THE STARS & STRIPES !!! As for myself I think the POLKA DOT HOUSE is very pretty and original !!! Be careful, safe and have a HAPPY DAY !!! That house is a hoot! Depending on the wind direction, tomorrow afternoon could be superb for viewing the raptor migration form Hawk Ridge above Duluth. Border guards, TSA employees, etc... I think they train them to not be too nice. Fear is what the govt loves to sell, so why have the enforcement do anything resembling kindness or empathy? People acting nice does not engender fear in people. Maybe I'm just paranoid. You're right, some folks are never happy, no matter what. All uniformed personnel are trained to think that anything outside there country is bad, dangerous, or just down right ugly. I don't blame them, they just don't know any better. You can't train soldiers to want to go up to the enemy and shake hands, although that would be my idea of making peace. Have you checked out the option of using your phone with the Canadian SIM to send texts in USA. Often this is our cheapest option although if we are Couchsurfing or in a country for more than a few days we usually pick up a local cheap SIM. Sounds like you are now almost backtracking on the route you recommended us to take across the States and it worked out really well. Have fun.